Klikněte na fotografii a zobrazte všechny dostupné fotografie k Stylish, Bright and Beautiful 1bed flat + sofa bed. 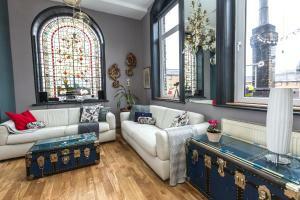 Stylish, Bright and Beautiful 1bed flat + sofa bed is a self-catering property located in London near Brick Lane. The Hoxton Square and the Tower of London are within 1.8 km and 1.8 km of the apartment, and free WiFi is provided. This apartment is fitted with 1 bedroom, a TV, and a kitchen with a dishwasher. There is a bathroom with a hair dryer. Tower Bridge is 1.9 km from the apartment. The nearest airport is London City Airport, 8 km from Stylish, Bright and Beautiful 1bed flat + sofa bed. A surcharge applies for arrivals after 21:30. All requests for late arrival are subject to confirmation by the property. The fees are as follows: Between 21:30 and 23:30: GBP 20 Between 23:30 and 1:00: GBP 50 Between 01:00 and 07:00: GBP 70 If you are more than 1.5 hours delayed for check-in there will a be fee. Please inform Stylish, Bright and Beautiful 1bed flat + sofa bed in advance of your expected arrival time. You can use the Special Requests box when booking, or contact the property directly with the contact details provided in your confirmation. Guests are required to show a photo identification and credit card upon check-in. Please note that all Special Requests are subject to availability and additional charges may apply. This property will not accommodate hen, stag or similar parties. This property is located in a residential area and guests are asked to refrain from excessive noise. A damage deposit of GBP 300 is required. You should be reimbursed on check-out.